BLOOMINGTON, Ill. (AP) — Showing no signs of trying to ease the nation's tense political atmosphere, Republican front-runner Donald Trump is standing by his antagonistic campaign rhetoric, rejecting any responsibility for violence at his rallies and defending his supporters who have been charged with assaulting protesters. "We're not provoking. We want peace. ... We don't want trouble," he told a large crowd Sunday in Bloomington, Illinois. Protests sparingly interrupted his remarks, less than 48 hours after he canceled a planned event in Chicago amid widespread altercations among his supporters, detractors and authorities. A near-riot erupted when news of the cancellation was made public. 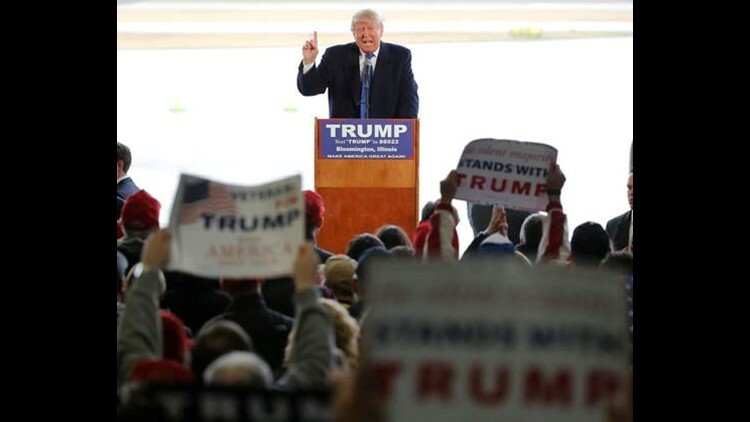 Yet Trump on Sunday again assured his supporters that their anger and even their occasional punches are righteous, because they are "disenfranchised" economically and provoked by "disrupters" that he says are sent by Democratic presidential hopeful Bernie Sanders' campaign. Sanders dismissed Trump's assertion that the Vermont senator's backers are responsible for the widespread protests. "To suggest that our campaign is telling people to disrupt his campaign is a lie," Sanders said Sunday on CBS' "Face the Nation." Some Trump protesters, including in Chicago, have been seen carrying Sanders campaign signs. Earlier Sunday, Trump confirmed that he's "instructed my people to look into" paying the legal fees for one of his North Carolina supporters charged with assaulting a protester earlier this month. With his rivals mostly blaming him for the Chicago melee and rising tensions, Trump counters that he's due credit for canceling the Friday rally and avoiding a worse outcome. Still, he claimed incorrectly that "nobody gets hurt" at his rallies, despite multiple videos showing protesters pushed, punched and bullied at his events. Whatever the interpretations, the atmosphere has yet to harm the front-runner heading into Tuesday's primary contests, including those in the home states of fellow candidates John Kasich, the Ohio governor, and Marco Rubio, the Florida senator. The winner-take-all contests will help determine whether Trump can be stopped short of the required 1,237 delegates required for the nomination, thus forcing a contested Republican convention in Cleveland this summer. Polls suggest Kasich has a shot at knocking off Trump in Ohio, while Trump appears to be holding his lead in Florida. Rubio has gone so far as to recommend to his Ohio supporters to back their governor. Kasich has not returned that favor. In Florida, more than 1.9 million voters had already cast ballots heading into Sunday, the final day of early voting. Republican ballots far outnumber Democratic votes, according to figures released by the state Division of Elections. Republicans account for more than 1.1 million early voters, while about 819,000 Democrats have cast ballots. Early voters are projected to account for at least half the total number of votes in Tuesday's primary. Trump will finish his Sunday schedule in Florida, following a scheduled town hall in Ohio. His first event Sunday was noticeably calmer than many of his recent rallies. A Bloomington police spokesman confirmed there were no arrests. The GOP front-runner's rivals — in both major parties — have since Friday increased their criticism of Trump's rhetoric, calling it dangerous and divisive, from his assertion that Mexican immigrants "rapists" and "criminals" to his repeated cracks about "punching" protesters and taking them "out on a stretcher." Rubio, a distant third in the GOP delegate count, compared Trump to third-world "strong men," and said the tone of the campaign "is really going to do damage to America." Rubio said on CNN that Trump is arguing to voters: "Don't put your faith in yourselves. Don't put your faith in society. Put your faith in me." On the Democratic side, Sanders said he has "millions of supporters," some of whom "will do what they do." Sanders said on CNN that Trump "is a man who keeps implying violence, and then you end up getting what you see." Trump answered during an interview on NBC's "Meet the Press." "I don't accept responsibility," Trump said. "I do not condone violence in any shape." Trump insisted his rallies are "peaceful," and blamed news reports of exaggerating the violence. He demurred on multiple Sunday talk shows when reminded of his litany of incendiary statements: he'd "punch" a protester "in the face," ''we need a little bit more of" hitting back and encouraging the crowd to "knock the crap out of" protesters. And he confirmed that he is considering paying legal fees for John Franklin McGraw, a 78-year-old Trump supporter captured on video sucker-punching Rakeem Jones, a black protester, as Jones was led out of a March 9 Trump rally in North Carolina. Trump says he wants "to see the full tape" before deciding whether to back McGraw. McGraw, who is white, "got carried away," Trump said on NBC, but "frankly wants to see America made great again." Jones has told The Associated Press that he and others went to the event as observers, not protesters. He says someone swore at one in their group, and by the time they tried to object, the police were escorting him out.